Fleas are not only major issues among dog owners; these are valid concerns among cat lovers as well. With more than 2,500 species of fleas all over the world, a very hardy outer shell once it reaches its pupae stage, and a very prolific egg-layer, these Siphonapteric parasites can be very stubborn to control. As such, the current recommendation is for the combination of appropriate flea treatment medications and environmental control. Unfortunately, even with the most judicious and well-planned flea pest control program can never fully eradicate these ectoparasites. However, we can always minimize the damage these pests bring to our beloved pets. For that we need to start with the use of only the best flea treatments for cats. 3. 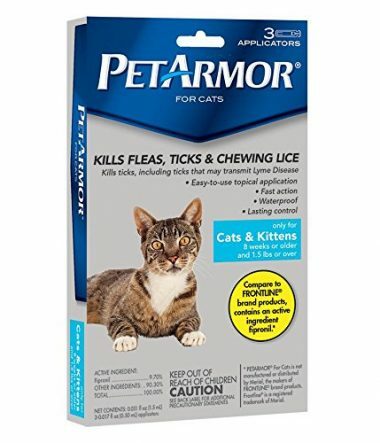 PetArmor Flea and Tick Squeeze On Cats and Kittens by FidoPharm, Inc.
What makes the Advantage II flea treatment for cats one of the world’s best is that it kills fleas in all 3 of their highly vulnerable stages: eggs, larvae, and adults. For adult Siphonapteroids, they are immobilized and killed upon contact, usually within the first 12 hours after application of Advantage II flea medicine for cats. It is also effective in killing fleas that reinfest your pet’s skin within 2 hours. They don’t need to bite into your cat’s skin for the active ingredients of Advantage II to start eliminating these pests. 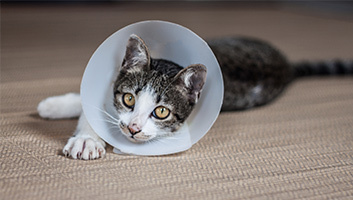 This is welcome news for those who may have pet felines that are quite sensitive to insect bites that they form rashes, itching, blisters, and even swelling on the skin. Advantage II contains both Imidacloprid and Pyriproxyfen. The former exerts its action by blocking nerve impulse transmission in the pest which leads to its paralysis and eventual death. On the other hand, Pyriproxyfen works by preventing the juvenile forms of fleas to grow or reach maturity. This effectively breaks the cycle since no eggs and larvae develop into pupae where they can mature into highly gravid adult fleas. 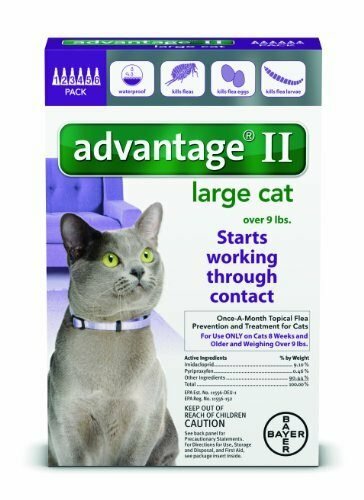 It is this combination of a powerful insecticide and an insect growth inhibitor that makes Advantage II one of the best flea treatments for cats. It is also waterproof and very easy to apply. Once-monthly application is recommended to achieve the best results. If the action of Advantage II is to block the transmission of nerve impulses in adult fleas leading to their paralysis, the mechanism of action of Frontline Plus is the opposite. Its active ingredient, Fipronil, is well-known to cause hyper-excitation of the nerves, leading to seizures in the affected insect. Because of the intense contractions of the muscles and the abnormal firing of the neurons of the flea, it can no longer support optimum neurologic functioning leading to its death. Technically, the end result is pretty much similar to Advantage II. There is loss of neurologic functioning leading to the pest’s demise. In addition to Fipronil, Frontline Plus also contains S-methoprene which is effective against juvenile Siphonapteroids. 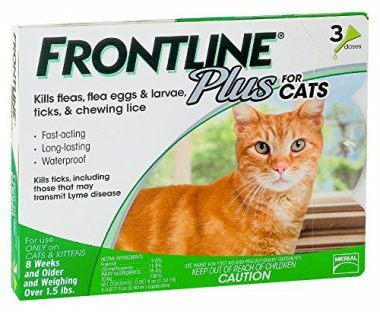 So, what makes Frontline Plus an excellent flea treatment for cats? Well, in addition to killing fleas in all of their developmental stages, it is also effective against ticks and lice. This is something that you cannot find in Advantage II. Technically, if you have flea- tick- and lice- infestation in your neighborhood, then Frontline Plus tick and flea control for cats is an excellent choice. It works fast, lasts 30 days, and is waterproof, although Merial advises waiting a full 24 hours after application before allowing your feline pet to get wet. PetArmor Flea and Tick Squeeze On Cats and Kittens by FidoPharm, Inc.
Want a cheaper version of Frontline Plus? If so, then FidoPharm’s PetArmor tick and flea treatment for cats in squeeze-on preparation is your best bet. It essentially has the same active ingredient as in Frontline Plus, Fipronil; although we are not really sure if it also contains S-methoprene. With the presence of Fipronil, however, you can expect it to be good against fleas, ticks, and lice, too. And if you’re going to look at the marketing strategy of PetArmor, emphasis is placed on its ability to kill various species of ticks. 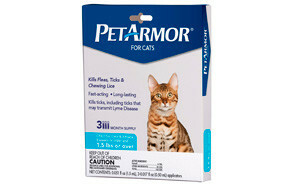 PetArmor is thus, a flea medicine that is also effective against other disease-carrying vectors like lice and ticks. 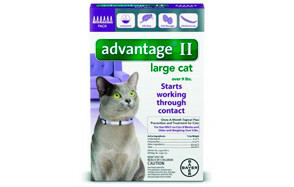 It is easy to apply, works relatively fast, and confers month-long protection for your pet cat. It’s waterproof, too. 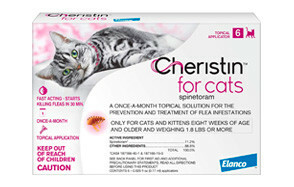 If you’re looking for a flea medicine that is specifically formulated for cats, not dogs or any other pet, then Elanco’s Cheristin is the best option for you. The key to its feline specificity in killing fleas is its unique ingredient – Spinetoram. 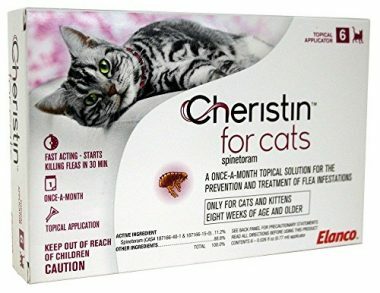 What is particularly remarkable about the active ingredient of Cheristin is that it exhibits the mechanisms of action of both Imidacloprid and Fipronil by working on both the nicotinic and GABA receptors, respectively, of the flea’s nervous system. In effect, it produces paralysis in some parts and massive seizures in the other, ultimately leading to the killing of the flea. This flea treatment for kittens and adult cats is only effective against fleas, however. Nonetheless, it doesn’t emit an offensive odor upon application which is quite pleasant as cats won’t be stressed out. Cheristin provides the same 1-month flea protection conferred by other products and starts killing pests within 30 minutes of application, often reaching full coverage in as little as 12 hours. It can also be used with other insecticides because of its low cross-reactivity to other chemicals. This makes it a lot safer to use if your cat’s only problem is flea infestation. The issue most pet owners have with topical applications is that they will never really know if the full dose of the flea medicine has been absorbed through the cat’s skin. Unless you have a kitty that doesn’t have any hair or fur, some of the liquid in topical applications can be wiped onto the hair shaft. To help assure your pet gets the correct dose you may want to give tablet forms of flea treatments for cats instead. 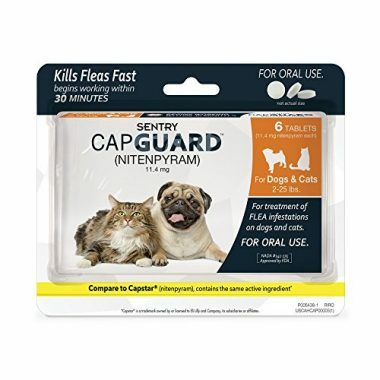 And when it comes to tablet flea medicine formulations, Capstar is the best. 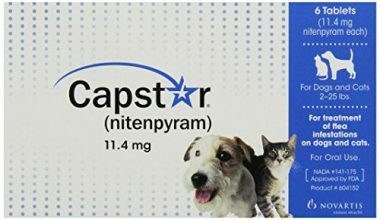 Boasting of Nitenpyram as its active ingredient, Capstar is known to kill fleas in just 30 minutes, typically continuing its insecticide activity for a whole 48 hours, peaking in as little as 6 hours upon consumption. Understand that Capstar is not intended for long term control of feline fleas. It is more of an adjunctive solution to other flea management protocols especially those involving the use of Lufenuron. Capstar only kills adult fleas and as such it is often important to make it as part of a larger program of insect control. 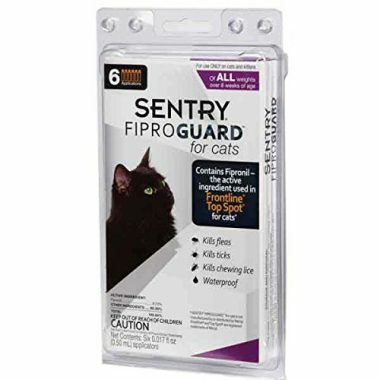 Another Frontline Plus alternative is this flea treatment for kittens and adult kitties from Sentry. Fiproguard contains the same active ingredient as Frontline Plus, thus conferring your pet with the same month-long protection, rapid acting insecticidal action, and effectiveness against fleas, lice, and ticks. Fiproguard is also topically applied in between the shoulder blades of your cat. If any, Sentry’s Fiproguard provides an even cheaper alternative to both Frontline Plus and FidoPharm’s PetArmor. We can look at Sentry’s Capguard as a very inexpensive copy of Novartis’ Capstar. It is formulated with the same Nitenpyram ingredient found in Capstar and as such you can feel more confident about its effectiveness as a flea adulticide. This also means that it can only be used as an adjunct to other pest control protocols especially in households where flea infestation is a major problem. Other chemicals may also have to be used if there are other pests in the area such as ticks, mosquitoes, and lice. Like the Capstar, Capguard begins to work its wonders in as little as 30 minutes, peaking within 6 hours, and lasting a full 48 hours. You might ask yourself why some people would still purchase Advantage when there is already the newer and more improved Advantage II made by the same company. Before you start judging people, it is best to identify the difference between these two products. Technically, the only difference is in their active ingredients with Pyriproxyfen already added to Imidacloprid in Advantage II. Now, understand that Pyriproxyfen primarily targets juvenile fleas such as eggs and larvae. 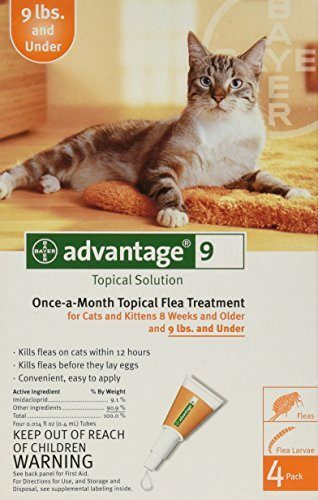 Because Pyriproxyfen is not included in the Advantage Once-a-Month Topical Flea Treatment for Cats, one can always think that this is best reserved for killing and eradicating adult fleas. 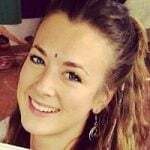 And since it is technically a flea adulticide, then it can be categorized as belonging to the group of Capstar and Capguard, although the latter two are in tablet form. That being said, this is especially useful for pet owners who may already have instituted other insect control protocols and will only need Advantage’s adulticide functionality to kill any remaining adult fleas. Performance-wise, it’s basically the same as the Advantage II. For those who are quite averse to giving their pets synthetic ingredients, Wondercide’s All Natural Flea Control Spray for Cats should be appealing. 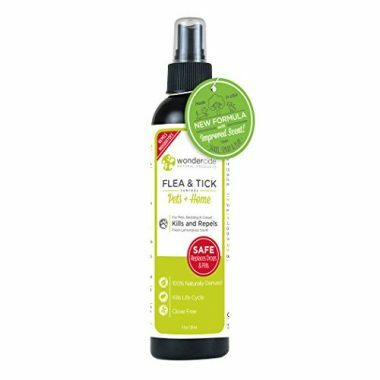 Do take note that this is not really a flea medicine for cats and kittens but rather as a natural solution that you spray onto various surfaces in your home which you suspect might be breeding grounds and hiding places of fleas. That said, it can also be safely sprayed onto your pet’s coat to confer it some form of protection against adult fleas, flies, ticks, and mosquitoes. It is composed of a blend of natural essential oils that have been proven to have antiparasitic and insecticidal properties, including organic lemongrass and cedar oil. And since it is made from only natural and organic ingredients, its safety is unquestionable. However, it may not be as effective as the other products in this list since Wondercide is only effective against biting pests. It repels them, nonetheless. Featuring three active ingredients that closely resembles the chemical profile of Advantage II and Frontline Plus, Ceva Animal Health’s Catego for Cats could very well be one of the best flea treatments for cats because of its unique chemical formulation. First off, it contains Dinotefuran which is a lot similar in pharmacologic action to Imidacloprid especially in the inhibition of nicotinic receptors in the flea nervous system. Catego also contains Fipronil which we already know as effective in inducing death in fleas by creating hyperexcitability in their nervous system structures. 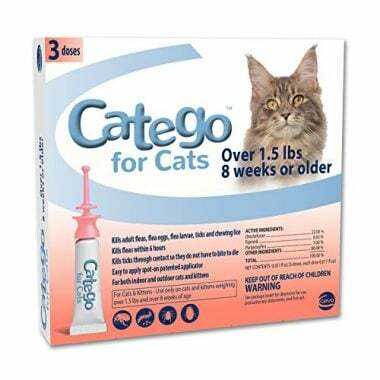 Thirdly, Catego contains Pyriproxyfen which is an insect development inhibitor, technically robbing the flea of any capability to reproduce by altering the growth and development of eggs and larvae. Because of this remarkable combination of active ingredients, one doesn’t need to wait 12 hours before majority of the fleas in your pet are killed. Unlike Advantage II and Frontline Plus that typically work their wonder within 12 hours, Catego accomplishes this in half the time. It also kills adult and juvenile fleas, lice, and ticks and can be easily applied once every 30 days. If any, Catego flea treatment is a lot like Cheristin in that it is specifically manufactured for cats only. We understand that choosing a flea medication for cats can be exceptionally frustrating as almost every other product on shelves look essentially the same. The only way you can pick the right one is by equipping yourself with the correct knowledge and skills related to the selection of such products. In this section of this post, we have prepared a comprehensive guide which will help you make that all-important decision as to which among the various products available in the market you simply need to pick. We have also included a listing of the different types of flea treatments for cats that you might be interested in, focusing more on their insecticidal effectiveness as well as ease of application. Towards the latter portion of this article, we’ll be providing you with some helpful tips on how you can maximize the full benefits of these flea treatments. What Should I Look for in the Right Flea Medication for My Cat? Choosing the right flea medication for your cat can be very easy. Unfortunately, many new pet owners are having trouble identifying the right flea control for cats. If you’re in the same predicament, you’d be glad to know that we’ve set up this list of the things that you will have to look for when choosing the right anti-flea product for your feline friend. Fleas are very prolific creatures. From eggs to adults, they don’t need many months until they reach their full reproductive capacity. That is why you may kill some of these pests today, but tomorrow some of them will already be crawling back to your hapless pet. This is how resilient and prolific these ectoparasites really are. And it is also for this reason that you are not supposed to be content on using flea medications on your pet alone. This should also be coupled with judicious management of your environment especially those areas where your pet frequents. That being said, a product’s ability to exert its insecticidal action is very crucial. You don’t want to wait a couple of days before you start seeing dead fleas on your cat because if this is the case, then you’ll be left with a still-flea infested pet. Quick-acting is quite different from rapid onset of action, however, and it would be wise to read the label of these products carefully. Some would say 30 minutes while others will say they require 12 hours or even 24 hours. For those products that put the 30-minutes in their label, this is often a reflection of the onset of action. It means the time it would take for the drug to begin exerting its flea control activity. For example, if you administered the flea medication now, you should expect to see a few dead fleas within 30 minutes. But this does not mean that you have totally eradicated the problem. This is where peak onset comes in. What products that put 12 hours or 24 hours in their labels really mean is that majority of the fleas that are present in your pet are already killed within this given time frame. So, after 12 or 24 hours, you can expect up to 99% of all fleas to be already dead. As much as possible, you would want to get a flea control product that can give you a fast onset of action, a fast peak onset, and an extra-long therapeutic effectiveness. For instance, you will be better off with a product that begins killing fleas in 30 minutes after application or administration, killing 99 percent of these pests within 6 hours, and extending this flea-killing property for up to 30 days or perhaps even longer. That said, two of the most important things you need to look for is a product’s fast onset of action and its reliability. The greater percentage of fleas and other pests it can kill in lesser amount of time the better. We have already mentioned that fleas are very resilient creatures. Each stage of their life cycle presents a challenge. As such, the effectiveness of a product is largely anchored on its ability to address these life stages. Fleas start as eggs and these are often found hiding in dark, moist, and warm places. After a few weeks, they hatch and become larvae which feed on almost anything organic. This flea stage cannot jump, but it sure can latch onto almost anything because of its very strong mouth. One weakness though is that they are especially vulnerable to heat. As such, you will find these larvae well hidden in deep crevices and cracks on the floor as well as in your backyard. After a few weeks, larvae form a cocoon to protect itself from the environment. This is the stage where it simply is very difficult to destroy. The maturing flea is well-protected inside its cocoon. It just waits for the right moment and the right stimulus to break through its casing and become an adult where it lays eggs and start the process all over again. Killing the adults will typically address the problem. However, the eggs, larvae, and pupae that remain to become adults will still have to be contended with. Killing the eggs is nearly impossible since they are so small and they are well-hidden from view. However, those that are already present on your pet’s skin should be highly vulnerable to the effects of insect development inhibitors. What happens is that they no longer have the capacity to form the super-hard protective shell of the pupae. This exposes them to a lot of danger and can ultimately lead to their deaths. As you can see, the only way to eradicate fleas is to make sure you have a product that addresses each of these life stages. Of course, this should also be combined with a thorough treatment of your house, your belongings, your backyard, and, if possible, the entire neighborhood. If in case a product only kills fleas at a certain stage in their life cycle, then you need another product to manage the other life stages. Different preparations of flea medications for cats can produce a variety of clinical complaints. For example, topical preparations can irritate or burn the skin of those cats with highly sensitive integuments. In some cases, staining can also occur. As for tablets, there is always a risk for gastric irritation and stomach upset. So, it is always advisable to let your vet check your pet first so any hypersensitivity can be established and the more appropriate formulation be identified. Additionally, different chemical ingredients are known to produce a variety of side effects. For example, if a topical flea treatment that contains Fipronil is licked by your pet, then there is a chance that nausea and vomiting, abdominal pain, weakness, dizziness, and even tonic-clonic type of seizures can occur. That is why it is very important to know how to administer these topical products the correct way to avoid getting these ingredients licked and ingested by your pet feline. As for Nitenpyram, excessive panting as well as hyper-excitability has been seen in pets 2 hours after the administration of the flea medication for cats. It is thus, imperative to choose a product that does not bring any additional harm to your feline friend. Side effects are a mainstay in all medications. Just pick one that doesn’t include life-threatening adverse reactions. Suffice it to say the ease of application or administration of the product matters, too. If you got a cat that has a very thick fur that you’re not sure if all of the contents of a topical formulation is absorbed by its skin, then you might want to stick with a tablet form or some other type of flea treatment. What are the Different Types of Flea Treatments for Cats? Since one of the factors that you need to consider when choosing an appropriate flea treatment for cats is the ease of application, then you must also be well-versed in the different types of anti-flea medications. Topical applications – These are very easy to apply and are considered very effective in both killing and preventing a variety of pests from infesting your pet. Many of these products are also available without prescription so they are relatively easy to obtain. The way they work is that the active ingredients are slowly absorbed in the bloodstream through the skin which then quickly paralyzes and inactivates fleas that are already present on the pet’s skin. There are also certain formulations where the active ingredients are emitted in the form of noxious fumes that only pests are affected. This provides its repellent action. Tablets – Tablet formulations of flea medications are just some of the latest innovations in pest control. These work by providing a highly concentrated dose of the active drug to instantly kill adult fleas. Sadly, these do not kill flea eggs and larvae, necessitating the administration of another drug specifically designed for such a purpose. As such, these formulations are primarily intended as an adjunct to other longer-term treatments especially those that contain ingredients targeting eggs and larvae. Oral drops – These are similar to topical applications with the sole difference of the drug being ‘dropped’ into the mouth of your feline pet instead of being applied onto its skin. It is equally effective but may not sit well with felines that are not good at taking medications via the oral route. Shampoos – Most of us have this notion that cats are particularly averse to taking a bath. However, this should be made a part of their regular grooming. Bathing also has the added benefit of allowing you to visually inspect the skin of your pet for any signs of flea eggs, larvae, or even adult fleas. In such cases, you can always apply flea medicated shampoos. Unfortunately, this is not really that effective as a repellent especially if your kitty happens to be a lover of the great outdoors. Also, its flea repellent smell typically fades over time. Collars – Considered as one of the most effective ways to supplement flea shampoos, flea collars work by providing a continuous stream of scent that is considered noxious to pests but are utterly harmless to other pets and humans. Sadly, since collars are confined to the head and neck region of your pet, there is a chance that fleas and other pests will congregate at the other parts of its body. As such, this should always be used in conjunction with other flea preventatives. Powders and sprays – While these are not really flea medications per se they are nevertheless considered an important part in the holistic management of flea infestation. These products are applied onto the various surfaces both in and out of the house including your beddings, furniture, drapes, carpets, and even rugs to kill any remaining or hiding fleas in various stages of its life cycle. In many ways, sprays can also be applied directly onto the fur of your feline friend to help provide protection when it ventures outside. Knowing how to select the appropriate flea medication for cats including the different types of formulations is just part of the multi-faceted approach to effective pest control. Equally important is the knowledge of how to use these products in the correct manner. Here are some tips to get you started. There’s a certain tendency by pet owners to forego seeking consultation with their vet just to save a few dollars from the piece of advice that will be given to them. After all, every bit of information you need is already in the internet, right? This line of thinking is fundamentally flawed. Just because you can access everything on the internet doesn’t mean that the descriptions provided in such forum are a perfect fit to your pet cat. Just like us, cats, too, are highly individualistic. They may share the same breed characteristics such as hair color and markings but their physiology will be vaguely different. It is in these physiologic differences that your vet can help by carefully evaluating your kitty’s health profile so you’ll be given a list of possible options to give as a flea remedy. These products are not natural substances of the body. As such, there is always a risk of drug overdose or drug toxicity. Since these formulations have been especially titrated to the smallest possible unit of measure to identify the minimum amount of drug that can elicit the most therapeutic response without creating unnecessary adverse reaction, obtaining the actual and accurate weight of your pet is very important. For example, Fipronil spot-on for fleas often has a recommended dosing of 50 milligrams per kilogram. This means if you have a 2-kilogram cat then you’re supposed to give no more than 100 milligrams to your pet. Unfortunately, spot-ons come in milliliters so you will have to compute for the actual dose to be given in mL by computing how many milligrams of Fipronil is contained in an mL of the spot-on. One of the characteristics of today’s products is user-friendliness. In fact, learning how to operate or run a particular device has become so easy that we don’t even need to read the manual anymore. Unfortunately, when it comes to medications, there simply is no foregoing the reading of the manufacturer’s directions. We are talking about the life of our pet here. If we take chances in our administration of the product, we risk losing our pets. Not only that, if we’re not careful, we might even endanger ourselves and that of our family. Make sure that the flea medicine you’re getting is designed for cats. While there are also products that can be used on other pets such as dogs, it is best to look at the recommended dosing especially for felines as their anatomies are inherently different from dogs. Additionally, you will have to listen to what your vet told you related to the most appropriate flea medication for your pet. Follow his or her instructions to the letter or refer to the recommendations of the product’s manufacturer. We don’t have to tell you to purchase only flea medications from reputable sellers. If your veterinarian happens to have a pet supplies section of his own, you can actually source your pet’s medication from the vet clinic. If you need to order online, make sure to do so from the official website of the manufacturer. Leading brands always have a .com site you can log onto to purchase your pet’s needs. If the brand happens to use Facebook for its company website, steer clear. You may have noticed quite a few inexpensive brands that have very similar characteristics as big name, more expensive brands. While it is true that the only difference between the two is price, you can never really be certain about the quality of the ingredients put into cheaper brands. It’s okay to go cheap, but not to the point that you compromise the therapeutic effectiveness of the product itself. Whenever you have to administer any of these medications to your cat, make sure that you are fully aware of the possible side effects. This way you can ready yourself to manage any of these reactions should they occur. Likewise, make sure you keep a close eye on your pet a few hours after giving a particular dose as this is often a critical period when hypersensitivity or allergic reactions can occur. How do you know that the drug is effective or not? Well, you have to read the label. If the product promises a kill percentage of 95% 12 hours after administration, then you should see a lot of dead fleas on your pet after 12 hours, with only a few still alive. If your observation is the reverse – after 12 hours there’s still considerable number of fleas – then you can say that the medication is not really that effective. Or perhaps you did not administer it correctly. At any rate, this will give you an idea of the general direction of the treatment. Treating our cats with the most appropriate flea medication starts with an understanding of the crucial elements to consider when buying a particular product, be it a topical spot-on, a tablet, a spray, or any other form. Its quick-acting properties, reliability, safety, ease of application, and spectrum of activity should all be considered. Lastly, you will need to know how to effectively give these best flea treatments for cats to optimize their benefits. It is only through the understanding and appreciating of these things that you can successfully control the flea infestation problem of your beloved feline.